The bustling city of Bangkok welcomes honeymooners to a plethora of exciting experiences; in particular the food scene is highly rated here with everything from Thai street offering local delicacies such as fried rice, noodles and soups. Foodies with a taste for fine dining can enjoy an array of restaurants that come with a romantic ambience such as Banyan Tree’s Vertigo and Moon Bar, which serves delicious seafood and cocktails that come with panoramic views of the city’s skyline, which is magical during sunset. In between trying the local delicacies, enjoy the cultural sights in Bangkok including the Grand Palace, Golden Buddha and Wat Arun. Great things to do in Bangkok on your honeymoon include a romantic cruise down the river on the luxury Apsara River Cruise where you can enjoy a 5-course meal as the sights of Bangkok unfold before your eyes. Aptly named, your first day of the jungle lake safari entails getting up close and personal to Asia’s largest land animals. You experience will include feeding, washing and interacting with the elephants. 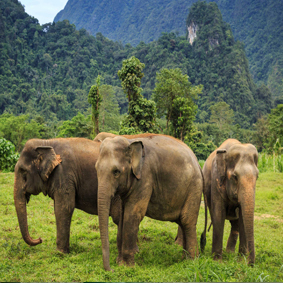 After tearing yourself away from the friendly elephants you will embark on a canoeing safari down the Sok River where you can take in the marvellous sights of Khao Sok. 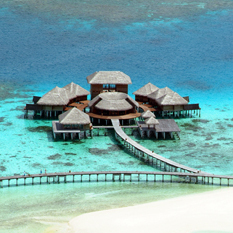 During the evening you can partake in activities such as movies, dance performances and cooking demonstrations. On your second day on the Elephant Hills safari you will visit a local market in Takhurn, where you will experience the rural lifestyle in Thailand. Afterwards you will hop on a traditional long tail boat on Cheow Larn Lake, which homes more than 100 islands in the lake. Watch out for the incredible sights of elephants, tropical birds, monkeys, amphibians and even leopards and tigers! Indulge in a spot of lunch in the rainforest camp, which is perched on the lake offering a sumptuous Thai buffet before heading back to relax in your luxury tent. After some relaxation you will be taken on a guided tour to explore the surrounding jungle by foot, this incredible tour showcases come encounters such as hornbills, gibbons, macaques and much more. 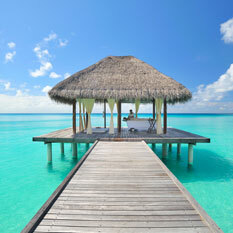 Phuket is a romantic destination with some of the finest beaches. Aside from this, Phuket is a great destination to island hop with the likes of Phi Phi Islands and Phang Nga Bay, which offer stunning, natural sceneries that create the most perfect backdrop for your romantic honeymoon. Great for spending time together, for the active honeymooners, Phuket offers a range of activities such as sea kayaking, white water rafting, bike tours, snorkeling and diving. If you love your sports, a chance to see the country’s national sport, Muay Thai is highly rated. The night scene in Phuket is vibrant, with cabaret shows, discos and club with live bands and International DJs. 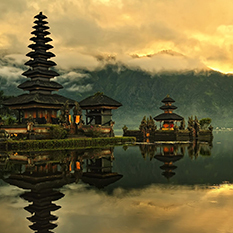 Phuket is home to some breathtaking viewpoints, which is worth hiring a car and checking out on your honeymoon such as the renowned Big Buddha, which is one of the island’s most important landmarks and sits on the Nakkerd Hills and can easily be seen from afar. Karon Viewpoint is another popular viewpoint to admire beaches, azure Andaman Sea, green hillsides and the neighbouring island of Koh Pu. 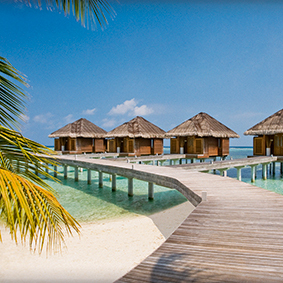 Below is an example itinerary. For a tailor made Bangkok, Elephant Hills & Phuket honeymoon multi-centre call 0121 440 6268. Located in a spectacular setting in the heart of Bangkok, close to Lumpini Park, the Banyan Tree Bangkok offers a great location, stunning views coupled together with its legendary Thai hospitality. 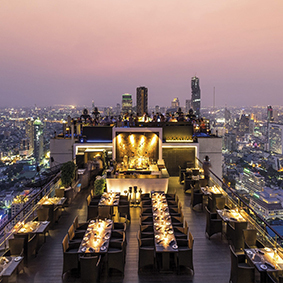 Banyan Tree Bangkok is renowned for its impressive rooftop bar, offering staggering views across the modern skyline of Bangkok. This award-winning hotel offers the height of luxury, on the 21st floor you can enjoy the spectacular city views from the signature swimming pool with bar and on the 61st floor you can enjoy the ultimate dining experience at the rooftop restaurant and bar with breathtaking city views. Stay in the romantic Oasis Retreat with floor-to-ceiling windows that are flooded with natural light. Make use of double-vanity black granite basins, a rain shower, oversized bath with twin head rests, city views, laundry service, and exclusive access to the living room. 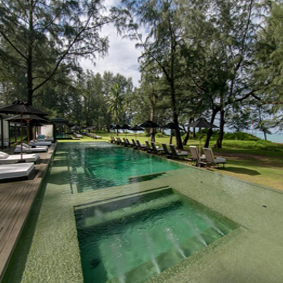 SALA Phuket is located on pristine Mai Khao beach on Phuket's northwest shoreline. The resort is just 20 minutes from Phuket International Airport and a short drive away from famous Blue Canyon Golf Course and picturesque Phang Nga Bay. For something special on your honeymoon, book an intimate dining experience where you can both enjoy a tantalising menu in a romantic location, or visit the award-winning SALA Spa with indoor treatment rooms and beachfront massage stations. There are is range of dining options at SALA Phuket including a beachfront bar and rooftop dining, which tables appear to float on their own reflection pond and offer gorgeous panoramic ocean views. The SALA Pool Villas give guests the feeling they are in their own private resort as the bedroom opens out into a private pool, garden and outdoor bathroom area. Situated in Khao Sok National Park in southern Thailand, Elephant Hills Rainforest Camp is placed in the center of the Cheow Larn Lake and compromises of floating tent accommodation where you will surround the gorgeous rainforest of Khao Sok National Park. 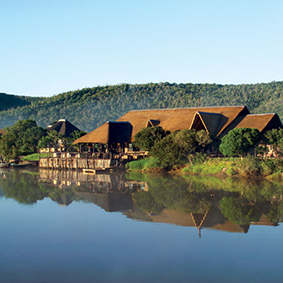 The unique safari tents include en-suite bathrooms and spectacular vistas of the lake. Enjoy your adventurous honeymoon in Thailand at Elephant Hills, where you can kick back and relax in your tent or take a dip straight in the Lake, which attracts a plethora of wildlife including birds and monkeys. Conveniently placed so you can enjoy the incredible excursions that the National Park has to offer as well as being close to stunning beach destinations in Thailand including Phuket, Khao Lak, Krabi and Koh Samui. During your time at elephant hills you will embark on a 2-day jungle lake safari. SALA Phuket is located on pristine Mai Khao beach on Phuket’s northwest shoreline. 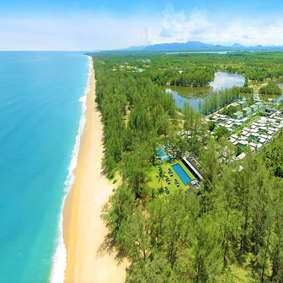 The resort is just 20 minutes from Phuket International Airport and a short drive away from famous Blue Canyon Golf Course and picturesque Phang Nga Bay. 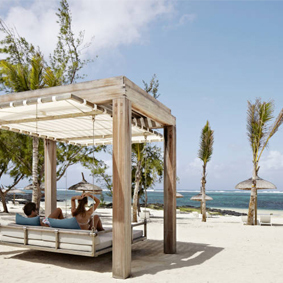 For something special on your honeymoon, book an intimate dining experience where you can both enjoy a tantalising menu in a romantic location, or visit the award-winning SALA Spa with indoor treatment rooms and beachfront massage stations. There are is range of dining options at SALA Phuket including a beachfront bar and rooftop dining, which tables appear to float on their own reflection pond and offer gorgeous panoramic ocean views. The SALA Pool Villas give guests the feeling they are in their own private resort as the bedroom opens out into a private pool, garden and outdoor bathroom area.